A ruthless thirst for access to new oil fields was a driving force by Sir Henri for his support for the most evil man in history. Sir Henri was himself described at one time as “The Most Powerful Man in the World”. The oil baron, able at the height of his powers, to bind the Board of Shell without their knowledge and consent, became an embarrassment to Shell because of his infatuation with Hitler and the Nazi. 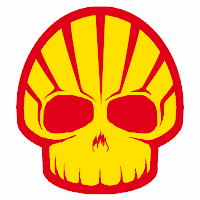 Like some Shell employees being culled in the Vosification process, Sir Phillip was escorted from Shell premises. However, in his case, he left with a severance package worth a reported $18.5 million despite bringing an end to the Anglo-Dutch twin company structure, which had lasted for 100 years. The unified company – Royal Dutch Shell Plc – rose from the ashes. The unfortunate association stemmed from the actions of a colossal figure in the history of the Royal Dutch Shell Group, Sir Henri Deterding, the ruthless Dutchman described as “THE MOST POWERFUL MAN IN THE WORLD”, the title of a book written about the oil baron by Glyn Roberts. Deterding was the man responsible for founding the Royal Dutch Shell Group and was at the helm of the oil giant for 30 years. He was known as the “Napoleon of Oil”.